Does your company have a plan D? "Digitization has reached us all and changed everything." There is no opting out of digital transformation. Successful companies carve out new strategic options for themselves – others fail. The future is not what it used to be. Digitization has reached us all and changed everything. Consumers, clients and indeed the whole economy have become faster paced, less predictable, and more volatile. The number of digital options open to businesses is growing exponentially, with no sign of letting up. At the same time, digitization poses a huge threat to existing competitive positions and is radically shifting companies' chances of winning the game. Anyone in a position of corporate responsibility – be it in a supervisory or top management capacity – should therefore be asking themselves whether their company is properly prepared to face digital disruption. Management doesn't make the right decisions at the right time. External upheavals change the playing field so profoundly that business as usual is simply no longer an option. Ideally, companies should right now be working out new strategic options and safeguarding their future success. In the worst case, businesses could cease to exist because they end up losing their customer interface, and because their share of the value chain shrinks to such a degree that they are left with no room for flexibility. 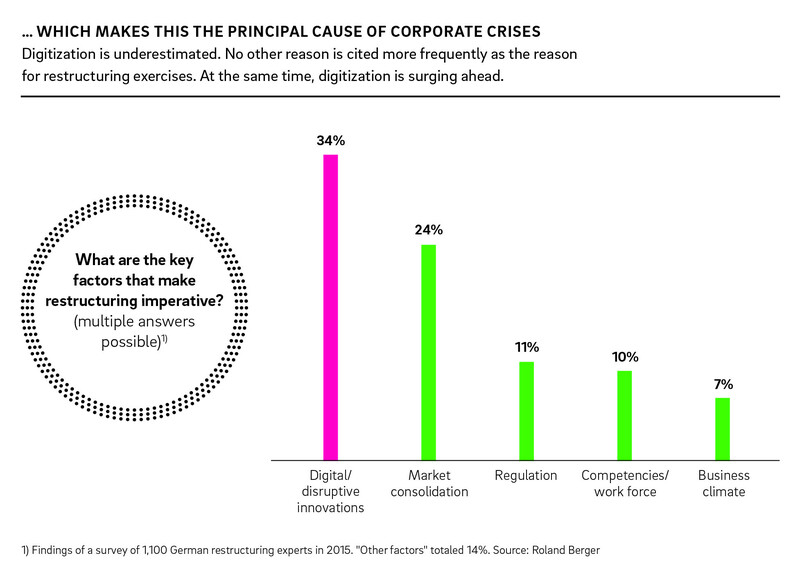 Digital disruption is the number one reason for restructuring exercises. Most companies have innumerable initiatives across the various business units and regions. Many such initiatives lack analytical depth and rigor. However, when the board wants to launch new ones, it is told that they are already established throughout the organization. Managers fall for the illusion that things are progressing. Yet they can't shape the digital transformation if they don't see the big picture. Many companies are already asking the right questions: are we cultivating the right knowledge? Are we finding – and capturing the imagination of – the right people? Are we mobilizing the right resources? The problem is that silo mentalities are still far too deeply entrenched for companies to piece together answers that form a coherent overall picture. Product categories, processes and even companies' view of customers are equally rigid and inflexible: at many firms, new topics are only ever tackled from the inside out. But if digital transformation is what you want, that is not enough. Organizations that still think in terms of status and prestige have, at best, a single plan A for their future. Precious few of them are open to a convincing digital roadmap: a viable plan D, which is both radical and plausibly quantifiable. How, then, do you break free of received thought patterns and the shackles of micro-planning? What path leads out away from the analysis of myriad individual factors and toward a broader take on trends? How do you expand your horizons to look beyond individual competitors and see innovative products and services? The notion that the best seats in the house are already taken is the first obstacle: Google dominates data, the Europeans make the best cars, and so on. No! The only thing we can say with any degree of certainty is that someone somewhere in the world of connected mobility will end up earning money with data. Yet that could just as well be companies from other industries – or completely new firms that do not even exist yet. So where do you want to take your organization? Where do you want to be in the long run? What will drive your growth and make you profitable? Digitization leads to the recombination of business models, so it is important to grasp one central point: In a world of such dazzling diversity, you cannot be equally good at everything, nor do you have to be. The digitization scenario – plan D – says nothing about what businesses will crumble in the digital future. Unlike in conventional scenario planning, it is not one of several possible scenarios whose probabilities must be carefully weighed to identify a series of "if-then" response patterns. Our radical scenario instead paints a constructive, optimistic picture of precisely those areas in which profitable new businesses can be tapped. Forget your competitors. Think about your customers! The key to reaching this goal lies in mapping out your ideal future scenario exclusively from the perspective of the customer. Such scenarios expose any blind spots by ignoring the limitations imposed by corporate, sectoral or market boundaries, by refusing to keep to rules of the game that are supposedly cast in stone, and by looking very far ahead without any regard to competitors. Why the latter point? Partly because no one can make reliable predictions today about who will still be in the game in the distant future, and because new players will in any case join the game and trample today's rules underfoot. But partly also because you can only truly unshackle your thinking and ideas if your vision of the digital future is not weighed down by historical baggage. Drawing up the digitization scenario is not merely an intellectual exercise. Putting numbers on the most important market, customer and product KPIs gives a very clear understanding of market developments and their consequences. 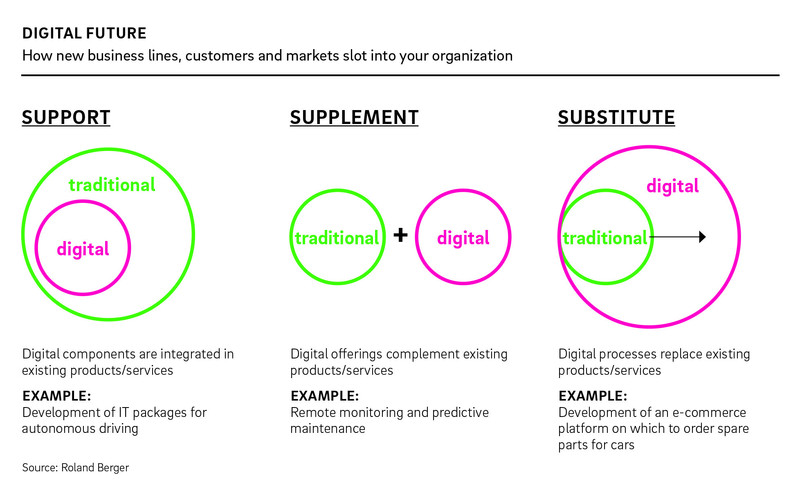 Never look at the number of digital initiatives, but rather assess their strategic consistency and how they combine. Never complacently tick off checklists, but rather constantly review and reinvigorate efforts. Never see themselves as the market leader, but as a challenger who must fight for their position – even in their own market. The digital transformation of a company should be seen as conquering a summit for the first time. Set off resolutely and at a brisk pace. Abandon what turn out to be blind alleys with equal speed and resolve. You can learn lessons from every mistake and gain strength for a new assault on the summit. What appear to be detours can sometimes get you to the top more quickly than an apparently direct ascent. That is especially true of the "rapid prototyping" phase – the phase in which new products or services are introduced. It is better to fail on the early foothills than spend too long waiting around and looking up. Iterative, collaborative development methods can be very useful on this score: they do not simply churn out any number of prototypes for new digital products and business propositions. Instead, they help you craft products, try them out, discard them and try again. As you work on development, it will become clear in what form of organization your prototypes can be groomed for success, as the chart above shows. One option is for existing products and services to be refreshed by digital components, just as autonomous cars benefit from advances in IT development. In such cases, digital business will be embedded in your traditional business. Second, your new business could complement what you already have, just as digital services monitor and handle the predictive maintenance of machinery. Traditional and digital offerings thus exist in parallel. The third option is where digital business replaces traditional models, just as e-commerce platforms have become the channel of choice through which to purchase spare parts for cars. Essentially, digitization does far more than merely adding extra business: It also has a profound impact on the world as we know it.